As All of us know that jio Which become currently largest 4 G network in India Which uses by more people than all other networks. Jio became largest 4 G network Because Of its offer . In the beginning jio offered Unlimited data from September to December as jio welcome offer . But Unfortunately jio could not completed their task of joining 10 million people to jio network . So date of jio welcome offer extended to 31 march 2017 as jio happy new year offer . And then jio launched jio prime membership plan for jio users to continuing jio Unlimited data offer for one in which users had sign up for jio prime in which users had to pay 99 rs to take jio prime membership and to pay 303 rs every month till 31 March 2018 . But jio users didn't take jio prime membership as much was expected by Mr. Mukesh Ambani. So Date for Jio prime membership extended till 15 April 2017. 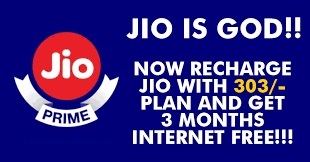 And Jio Happy New Offer extended for more three months as Jio Summer Surprise Offer . In Jio Summer Surprise Offer jio users get unlimited mobile data (with a 1GB daily data FUP) for free, 100 SMSs per day, as well as free access to the Jio suite of apps, such as Jio Cinema and Jio Music. Voice calls will remain free for all Reliance Jio subscribers, whether enrolled in the Jio Prime membership or not. However, unlike the Jio Happy New Year Offer, the Jio Summer Surprise offer is only applicable to Jio Prime members who purchase the Rs. 303 (or higher) prepaid recharge or enrol in the Rs. 303 (or higher) postpaid plan.